Here’s the problem: when Rox was hired, she told her smoking-hot boss Cash that she was married, but she’s not. Now, three years later, she’s kind of accidentally living with him, and he’s being a perfect gentleman, dang it. Everybody in the office said that Cash was a heartbreaker, that he’d bump her and dump her, so Rox decided not to become a statistic. She went out and bought herself some rings of the finest cubic zirconia so that she could work with Cash, who was several inches over six feet tall, emerald-eyed, ripped, gorgeous, his tailored suit clinging to his athletic body, sporting a British accent, and loaded. It had seemed like such a good plan at the time. But now, three years later, she and Cash have become friends. They travel together for work often, and they’re the best of buddies.When Rox gets thrown out of her apartment, Cash insists that she come live with him until they can find her a place because that’s what friends do. Now, even though everyone insists that Cash never goes after married women, something about him has changed. There are little touches, little slips, and Rox is more and more tempted to tell hunky, gorgeous Cash that she never was married. And then he’ll take her and break her, and then he’ll walk away, and then she’ll lose her job, and she still hasn’t found a place to live. And yet, every time her looks at her with mischief in his dark green eyes, every time they’re teasing and it somehow turns into tickling, every time she swats at him and somehow ends up in his arms, she wants so much to risk everything. What’s a working stiff to do when she falls in love with her friend, the boss? Casimir bounced the back of his head softly against the door in time with his thoughts. It did not matter if Rox would be under his roof for a day or two. It did not matter that sometimes a ghost of other circumstances had flitted through the house and through Casimir’s mind, a ghost that looked suspiciously like her sumptuous dark hair spread on his pillows or her plush body sprawled on his sheets. Perhaps his attraction for her was merely for forbidden fruit, he consoled himself. If he’d had a chance with her, perhaps he wouldn’t feel so strongly. It was probably an illusion. Perhaps she wouldn’t walk through his dreams, handing him contracts and then looking up through dark eyelashes with her hazel eyes that reminded him of pale caramels from home before she melted into his arms. She would only be at his home for a day or two. He rubbed the back of his skull. That last bonk had smarted a bit. Looks intriguing! I downloaded it for free!!! Loved the excerpt thank you. Congrats and thank you for the Free share!!! Happy book tour! I love the cover and would love to read this book. 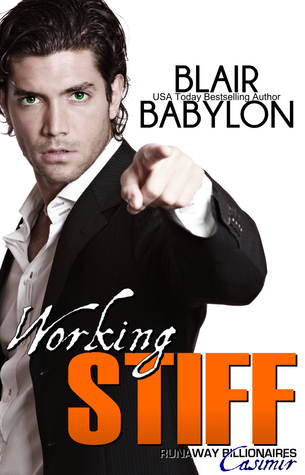 I would like to give thanks for all your really great writings, including Working Stiff. I wish the best in keeping up the good work in the future. Thanks for throwing the Book Blitz and Giveaway.